Have you ever struggled to get the perspective right, particularly when drawing buildings? Or have you never contemplated drawing an architectural scene because you think it is too difficult? These practical workshops will give you the tips, techniques and practice to handle this subject with confidence. AM: Teaching from her home studio situated in the quiet cobbled streets of Winchester, Katherine will show you how to use perspective to create realistic 3-D drawings of buildings and street scenes. 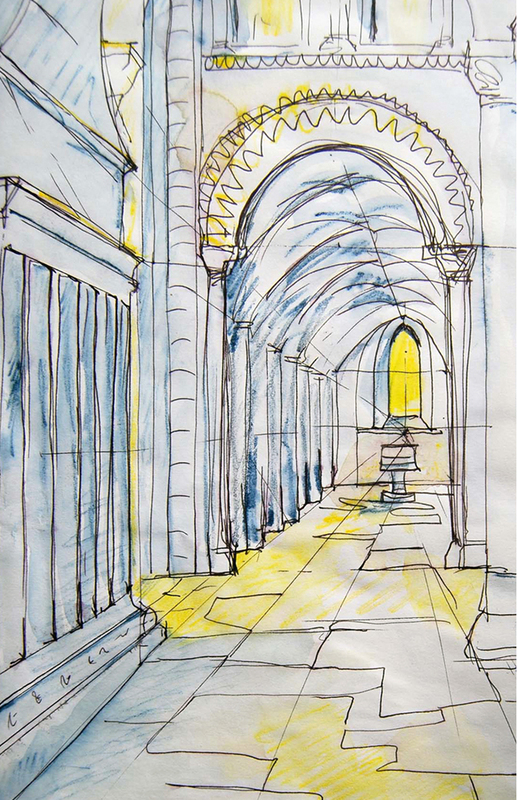 PM: Taking our sketchbooks outside to draw Winchester Cathedral and the High Street, we put into practice what we learn in the morning session with Katherine on-hand to guide and advise ( town is a 5-10 minute easy walk from Katherine's home). No prior experience necessary. Class sizes limited to 5 people. Full Day Classes, 10 am - 4pm. £50 per day, or £90 for two days, £120 for three days. Monday 4th June, Friday 15th June, Thursday 28th June, Saturday 7th July, Wednesday 25th July. Two-hour Classes, 1 pm - 3 pm. £16 per session, £30 for two, £40 for three. Friday 6th July, Friday 13th July, Friday 20th July, Friday 27th July, Friday 3rd August, Friday 10th August. Tea, coffee and cake is provided. Lunch is in Katherine's lovely walled garden - bring a packed lunch, or order from Katherine at £5 per person.